At the 2013 Entertainment Technology Expo, we were able to visit with Bernie Keach of Marshall Electronics about their new QVW-2710 2k/4k Quad Viewer. 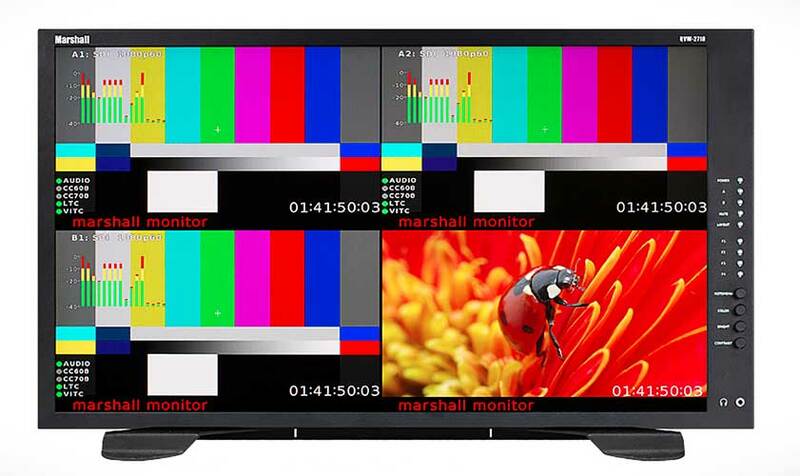 This monitor has four independent 3G-SDI inputs to view four channels at once in a quad view mode. It can accept an HD, 2K or 4K signal using one or more of the 3G inputs and display a single image full screen. The QVW-2710 has four independent 3G-SDI inputs to enable users to view four channels at once in a quad view mode. Additionally the QVW-2710 can accept an HD, 2K or 4K signal using one or more of the 3G inputs and display a single image full screen. The QVW-2710 Quad-Viewer Monitor features an all-digital TFT-MegaPixel active matrix LCD system with 2560 x1440 (QHD) native resolution at 10bit picture depth and Ultra-wide gamut. Three different quad layouts are available and the side-by-side mode allows any two consecutive channels to be viewed on the screen at one time. In-Monitor Display allows on-screen text and tally indication, controlled locally or remotely via a variety of industry standard protocols. The On Screen Display shows embedded time code, embedded audio presence indicator and closed caption presence indicator for 608/708 captions. Stereo audio can be monitored for the selected SDI input through a front panel headphone jack. The rear panel Line out stereo jack user to process stereo audio for the selected SDI input. The QVW-2710 supports audio bars and markers. In addition, it has USB and Ethernet ports and an RS-422/485 port with pass-through. Additional features include color temperature adjustment, aspect ratio settings, blue-only mode, and monochrome mode. Pixel-to-Pixel mode allows native display of any incoming image format. Users can set four function buttons to their desired settings for quick access and adjustment.